Committed to cutting-edge innovation and excellence in photographic accessories. The Phottix track record speaks for itself. Holder of 40 patents, Phottix achieved acclaim for its award-winning Phottix Odin TTL Flash Trigger - the first trigger to feature full TTL and Manual Power and flash zoom control. The revolutionary Phottix Mitros+ TTL Transceiver Flash built a radio TTL flash trigger and receiver into a hot shoe flash. 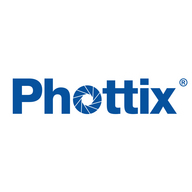 In the last five years Phottix has become a dominant force in the photography industry. Phottix’s electronic accessories run the gamut: From the innovative Phottix Indra500 TTL Studio Light, Mitros™ series of TTL Flashes, the Phottix Odin™, Strato™ and Ares™ series of Flash Triggers, shutter releases, to lighting and studio solutions. All Phottix products are developed with feedback from professional photographer – to assist in overcoming the challenges they face. Phottix’s 2015 product line-up takes photography solutions to the next level with yet unseen technology, compatibility and durability.